Kings Cross and Warren Street underground stations have become the first two underground stations to rock Virgin Media's free Wi-Fi as of today. 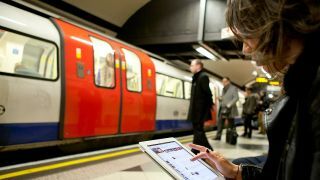 There'll be no excuse for travellers to be out of the loop at Oxford Circus or Green Park either as they get connected tomorrow, with Victoria and Euston going live on June 9. If you find yourself twiddling your thumbs on the platforms of any of these stations this week, all you'll need to do to connect is register your email address. The Branson-flavoured company announced that it will be bringing free Wi-Fi to 80 underground stations this summer, with a PAYG service and access to a Virgin-branded portal available after the free Olympics-inspired internet party ends. Some Virgin Media customers will then see the underground Wi-Fi access included as part of their packages. London's bike-loving mayor, Boris Johnson, commented, "We need to ensure London is able to cement its position as Europe's leading digital city. "Our partnership with Virgin Media to make Wi-Fi available on Tube platforms will be of tremendous benefit as building world class connectivity is critical to supporting new businesses and the jobs they create, especially in the high-tech and creative sectors." The company announced the initial station line-up last week – you can check out the list here – with a further 40 connections planned to go live by the end of the year.